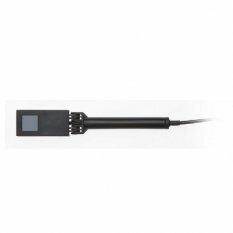 The PD300-BB-50mW radiometric sensor has a flat spectral response photdiode sensor for measuring broadband light sources. It covers the spectral range 430 – 1000nm and has a 10x10mm aperturewith swivel mount and a removable filter. Without filter its power measuring range is 50pW – 4mW. With filter the power range is 1nW – 50mW. The sensor comes with a 1.5 meter cable for connecting to a meter or PC interface.